Why are the overachieving ‘Good Girls’ often ignored at work, frequently bypassed in their careers, and even criticised for their exacting standards instead of applauded, promoted and encouraged? 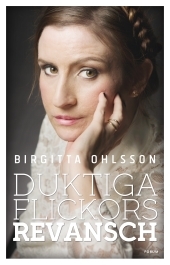 Swedish high profile liberal politician Birgitta Ohlsson pens a personal and forceful exposé on modern feminism from the angle of the chronically overlooked Good Girl. The quiet, hard working woman who always delivers to deadline, always achieves a little more than is expected, always gets the job done and then some, and yet fails to win the big promotion. Tired of being used as a calming influence for misbehaving boys at school, tired of watching the same loud, not-as-qualified men get promoted and chosen over her at work, and tired of being told to relax her exacting standards, Birgitta Ohlsson offers a road map to modern feminism directed at all women (and men) – not just the overachieving Good Girls, but definitely them too! Ohlsson has written a fiery call to arms aimed at her female compatriots designed to encourage and embolden the Good Girl to step into her rightful position.